Cinnamon Bark Essential Oil is part of the Rocky Mountain Oils Wellness collection. Diffuse Cinnamon Bark Essential Oil to help purify the air. A stimulating, hot oil, Cinnamon Bark Essential Oil should always be diluted with a carrier oil to prevent skin sensitization. Massage into the abdomen using clockwise strokes. Patch test before use to ensure that your skin can tolerate the hot oil. Hot oil and a dermal irritant. Dilute with a carrier oil for topical application. Not to be used while pregnant or breastfeeding. This oil is superb in every way. I diffuse this with clove oil and it is amazing. Highly recommend this oil and the company too. Very pleased. I liked it. Thank you. My experience with this company has exceeded expectations. Shipping time was outstanding. My oil is as i exoected. I mix the cinnamon bark with orange oil in my diffuser. Instead of artificial scents, I have a wonderful combination of a warm earthy mix. I feel it also helps with eliminating flu and cold germs. Potent but still nice to diffuse. I like to dilute it with water and some blood orange. I love Cinnamon Bark! It's perfect to diffuse in the fall and winter especially! I love the smell! It is great for diffusing seasonal scents. I use a combination of cinnamon and nutmeg which is warm and purifying. We enjoy it at bedtime even though the cinnamon is stimulating. this cinnamon bark is great and will be ordering more! The scent of this essential oil is amazing! I put a few drops of it along with some sweet orange oil and my house smelled heavenly! Very lovely scent. I have been mixing it with nutmeg and clove in my diffuser. My house smells great and it relaxes me. Perfect Christmas oil(s). Everyone needs a bottle of Cinnamon Bark! A new staple! You can make ANY seasonal blend with this as a base. Will continue to purchase this again and again. Smell so good you’ll wish you bought 2! My girlfriend yesterday said she wanted to start using the other oils because she doesn’t want to go through our first order of cinnamon bark. I love the taste of cinnamon and smell of cinnamon, this oil is my favorite to use. 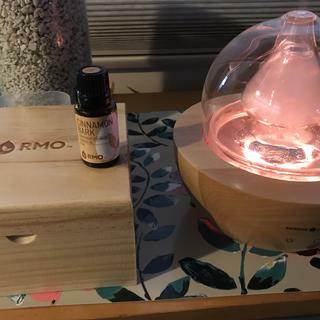 RMO’s Cinnamon Bark oil is superior in quality to most. With just three or four drops added to a diffuser, there is a bold and brilliant, fiery spiced undertone that gently lingers in our home for a full day. During the holiday season I love mixing 3-4 drops of cinnamon, a drop of clove, a drop of orange and a drop of patchouli oil. But just the cinnamon oil alone will do if you want to generate a nice atmosphere for houseguests, or while savoring that cup of hot cocoa alone on a cold Winter’s night. I find it warms my bones, and also helps strengthen my immune system. Got this to use in the fall diffuser blend. Smells wonderful! This product is exactly what I was looking for! This oil has a wonderful scent, and I look forward to diffusing it often. I LOVE diffusing mixtures with cinnamon. I love Rocky Mountain Oils. I was almost out and bought an off brand one I saw. It was not worth the discounted price. I will never make that mistake again.. I recommend it, it's a true smelling and feeling cinnamon. Cinnamon is my absolute favorite to diffuse, and ROM is amazing!! A few drops goes a long way....awesome quality!! Happy scent! So many oils to mix it with. Yet the cinnamon adds such a clean aspect. Very enjoyable. I diffuse this oil and it is the assertive cinnamon smell I hoped for. I love the quality of all my Rocky Mountain Oils. This oil smells amazing. I love mixing it with orange to diffuse. Love this one. A little goes a long way. It smells just like a red hot. I have been using my cinnamon bark oil in my diffuser. Love it's delicious smell. The smell of Cinnamon Bark is exactly what you would expect it to be, very crisp and aromatic. Very pleased with it; it was an added bonus that it came when our home needed it the most; during flu season! This cinnamon smell lasts much longer than the blend. It only takes a couple drops added to diffuser for the smell to fill the room. The smell lasts also and doesn't fade like the cinnamon blend does. It's a great smell for Christmastime. Love the smell...just like something is cooking on the stove! Smells like happy, joyful Christmas! Best essential oil ever. It smells so good and warm. It makes my house smell just like Christmas. I love the smell of this. It makes my thieves oil smell wonderful. It’s Cinnamon Bark smells great just like cinnamon should !! I blend this with orange and nutmeg and it smells sooo good! Im totally pleased with the quality of my cinnamon oil and highly recommend it to those thinking about trying it. I loved it the moment I opened the bottle. Actually, Ive been satisfied with every product Ive ever ordered from RMO. I love this oil. I used it with some other oils for a Fall room spray and I absolutely love it!! Love the fragrance. Just so lovely. This oil delivers! It has a solid scent that does not fade. Love the smell of this oil it's warm and inviting. I love this stuff. It provides a great aromatic scent when diffused, and/or placed on pine cones for scent. My favorite way to use it is to place several drops on a cotton ball, vacuum up the cotton ball, and proceed by vacuuming. It's very similar to a vacuum sachet, but provides awesome health benefits. I use cinnamon bark on my sore joints and muscles. It seems to ease any pain I was feeling. Make sure you use sparingly with enough lotion, or you will feel a burning sensation. Great smell. I also add a drop of cinnamon bark along with a spoonful of coconut oil to my hot chocolate every night. I love cinnamon bark. I use it with spruce and orange to make a wonderful scent in my diffuser! Cinnamon Bark is great for so much. I love adding a drop to enhance certain blends or a few drops to peppermint or orange for that perfect seasonal scent. This oil smells pure, not fake or synthetic. Can you take this internally? BEST ANSWER: Essential oils are very potent and can be dangerous if not used correctly. We do not give recommendations for ingestion as the body can safely absorb essential oils by topical application or diffusion. All of our oils are 100% pure, natural, and authentic. How do you make your thieves? BEST ANSWER: We do not carry Thieves as this is specific to a different company. We do have a comparable though! We would recommend checking out our Immune Strength and Sacred Immune Strength blends! what is the difference between cinnamon bark and cinnamon leaf? thanks! BEST ANSWER: The biggest difference is that the Cinnamon Bark essential oil is extracted from the bark and Cinnamon Leaf from the leaf of the plant. Cinnamon Bark is definitely a much stronger choice when it comes to the wonderful spicy aroma and is much "hotter". I see that this only mentions topical and household. Does that mean it’s not used in a diffuser? BEST ANSWER: Cinnamon Bark is also safe to diffuse. The topical and household icon is simply the best-recommended use. Diffusion can still be beneficial and is not harmful. We diffuse our cinnamon all the time. However, a little goes a long way. We love it! I have used it in my diffuser. I love the scent at the holidays!! You can absolutely use it in a diffuser. Are your products of essential oils with organic ? All of our essential oils are 100% pure, natural, therapeutic and organically grown. They are GMO-Free, GC/MS and Pesticide tested. Thank you for your info . Is there marking of ‘organic’ on the bottles of your essential oil products ? Is the cinnamon bark food grade? BEST ANSWER: Excellent question! We do not suggest using Cinnamon on or around children under the age of 10. How long is this oil good for? BEST ANSWER: Excellent question! Our oils do not have an expiration date. Essential oils do not “go bad” in that they become rancid, but their therapeutic properties can lose potency. If kept in a cool (room temperature or cooler), dark place with the cap tightly sealed, all oils should maintain their therapeutic potency for about 3-5 years. However, citrus oils have a shorter time frame of 1-3 years. Some oils, such as Patchouli, Vetiver and Blue Tansy actually increase in potency. Can you cook with cinnamon bark essential oil? BEST ANSWER: Good question! We do not have an exact date when it will be back in stock. It is still available in the 5mL size. How come the price of cinnamon bark oil jumped up so high? What is the difference between Cinnamon bark and Blend of Cinnamon oils? BEST ANSWER: Blend of Cinnamon is Cinnamon Bark in a base of Fractionated Coconut Oil.